See the Hand of God come down from Heaven and shake the entire range as each 500 S&W round is touched off. Matt learning the true meaning of 'recoil'. Early 2005, I gave in to temptation and bought 4 inch barrelled Smith & Wesson 500 magnum. It's big, loud, shiny and a whole lot of fun. Here are some miscellaneous thoughts after only a couple weeks of ownership. The size is truly impressive. Above, you can see the 500 next to both a S&W 327 - N frame revolver and a full size Beretta Vertec. It's heavy too at 56 ounces unloaded. Ammunition is crazy expensive, reloading is a must. The grips do an excellent job of absorbing some of the recoil. Muzzle jump and muzzle blast are pronounced. Jacketed flat point bullets are difficult to 'pull' once they've been seated too far. Sometimes, the jacket separates from the 'lead slug' inside, effectively plugging a fully charged case. Where I'm from, we call this a "clue"
My 1st range session with the 500 was 15 rounds long. I had to stop because I was grinning and laughing so hard, my groups were suffering... The 2nd range session with the 500 was more eventful. After 18 rounds, I couldn't rotate the cylinder. This turned out to be a piece of metal jacket stuck to the forcing cone. 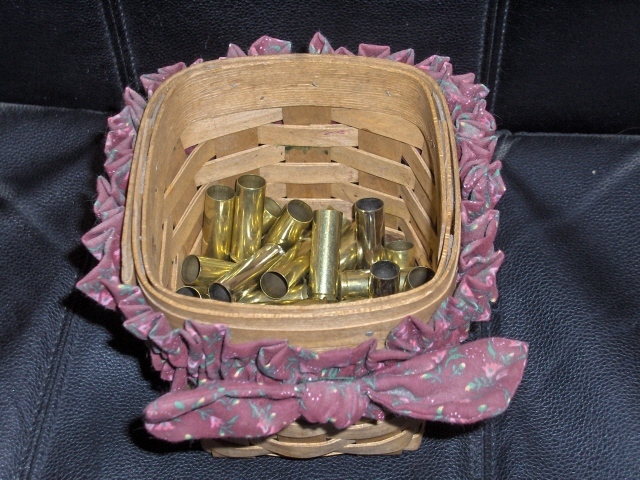 I fired off a few Cor-Bon 350 grains, and had some guest shooters. I finally saw the muzzle flash watching the guest shooters, and it is impressive. I also noticed that the gun is 'torquing' to the right (clockwise) during my follow through. Controllably, but more so than other magnums. After many more rounds, and now some handloads, I can wholeheartedly say that it's tough to not like the 500 S&W. I have worked up loads for 350 grain and 500 grain Hornady jacketed loads, they were kind enough to send me load data by email. I've used Hornady's XTP previously in other calibers with good success. Hornady's willingness to help only reinforces my like for the company and their products. 500 load data continues to be developed. The 2 main powders I'm using are H110 & Lil' Gun from Hodgdon. With 350 grain bullets the maximum load listed by Hodgdon for H110 is 43.0 grains (43.3 from the Hornady manual) & 42.0 grains of Lil'Gun (38.6 in the Hornady manual). I have run the 43.3 of H110 & 42.0 of Lil Gun with excellent results, no overt signs of overpressure, no stuck cases, no split cases, no excessive primer damage, etc. For the 500 grain slugs, Hodgdon says 33.0 grains of H110, Hornady says 32.5. I worked up .1 grain at a time to 33.0 and again had no problems. With Lil'Gun the Hornady manual says 28.7 max, Hodgdon says 30.0. I have worked up to 29.0 as of 06/08 with again no signs of trouble. See the Hand of God shake the entire range.